You may love running outside, cycling on a greenway or roadway, or practicing yoga on your own, all for free. Still, you might also enjoy and benefit from a workout at a gym, lifting weights or doing resistance exercises using special equipment, taking an indoor cycle class with friends, swimming in a full-length pool, or running on the treadmill when it’s rainy, windy, or freezing outside. Privately-owned gyms often have free classes or days when all classes are free and open to the general public. In my area, friends have told me about freebies at their gyms: a women’s-only facility hosts a dance-type class on Sundays, and a CrossFit location holds Saturday sessions at no charge. Such offerings provide a way for owners to give back to the community and, at the same time, attract new members. Many personal trainers, triathlon coaches, running coaches, and the like partner with local gyms and Ys to get you ready for specific athletic events. These training programs help prepare you for 5Ks and other road races, challenge events like mud runs, and triathlons. The program fee may include a short-term membership at a local gym or Y, even if most of the training is done offsite. For example, I completed a 12-week sprint triathlon program that included a 3-month membership to the YMCA. Participants paid for the training program but got to use the gym at no additional charge. The YMCA, YWCA, and private gyms often give free passes for a few visits or unlimited ones for a month or some designated period. At the local Y, you might be able to snag a pass on your own or get one from a friend who is a member. Privately run and specialty gyms may be more generous with freebies, allowing you to visit several times in a given month as a way of enticing you to join. Community outreach arms of local organizations occasionally offer free exercise programs or single sessions to area residents as a way of encouraging healthy habits. Sometimes sessions are held at local fitness gyms and studios, giving you the chance to visit the facility, use equipment, and check out specialty classes. Look for a schedule of programs sponsored by area hospitals, health promotion agencies, parks and recreation departments, and even your own employer. You may need to register for a newsletter or health "club" to hear about the activities but generally these are free health resources. Someone has to pay for the membership but in this scenario, using the gym is technically free for you. If you are hoping to avoid getting stuff that will clutter your home, then you may ask for an annual gym membership depending on the gift-giver’s budget. Similarly, consider asking your employer for a free gym membership as an employee benefit. When you are staying at a hotel, use the gym for free (ditto for a resort). The size and quality of these facilities vary, but you should be able to find cardio and weight equipment. If your job requires lots of travel, consider getting free gym workouts when you are on the road and exercising outside when you are home. The fitness facilities at many colleges and universities are outstanding. As a student, you will likely have access to these gyms for free. They may include studios for group classes, weight training machines, indoor tracks, basketball courts, swimming pools, and climbing walls. Most schools grant access to full-time students only. But if you are thinking about taking a class, ask about part-time student benefits to see if you are eligible for free fitness services. Alternatively, you could get a job with a college, university or other organization that allows use of its fitness facilities. Finally, if you don’t want to get a job just to use the gym for free, consider bartering services for free classes. Workout for free while you decide your next fitness move. You may discover that the gym becomes an essential part of your regimen. Or, you could find that — while occasional visits to a new facility are invigorating — you would rather exercise outside or in your home gym. 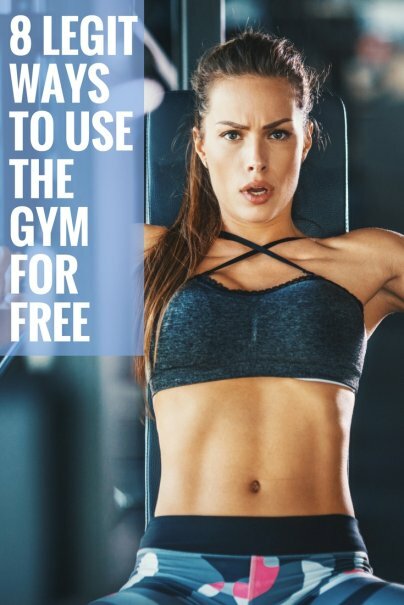 Have you enjoyed the use of a gym for free? Great tips! I once received a one-year gym membership on my birthday. That was a great experience! I did not only lost weight and toned some muscles but I also learned a lot of things about exercise and diet. Glad to hear your story with real-life confirmation of the value of gym membership as a gift. I'm just going to throw it out there that the YMCA is a nonprofit organization that uses every penny that it makes to make the community a better place to live and give people access to health and wellness that may not otherwise be able to afford it. By taking advantage of them, it takes away from the community. It's okay to try it for a day or two for free, but try to think about the benefit of the Y in your community as well. Thanks for reading this. Thanks for your comment! I hope that no one got the idea that I was recommending taking advantage of a gym or Y -- the idea is to use free services that are offered, well, freely. I recently joined the YWCA after several years at the YMCA so I am aware that these organizations have missions that go beyond profitability, such as community outreach. Part of my membership fee at the Y goes to help women who are recovering addicts for example. But I feel that that non-profit status doesn't mean that I shouldn't print off the guest pass that comes with the Y's monthly newsletter and invite a friend for a workout, or give to a friend for a free workout, as long as we follow the stated guidelines. I used to work at the Y.... we had "one week free" promotions several times a year, but everyone was entered into our database and if you tried to sign up more than once in a calendar year, you'd be denied. We also asked for (and photocopied) IDs of people who signed up so they couldn't scam their way in. Thanks for sharing your experience, and glad that the Y had controls in place! Good tips! There are also an increasing amount of housing communities that offer exercise facilities similar to what you might see in a hotel. They might not have quite what a big health club has to offer, but still can get the job done. I had no idea some of these options even existed. Now I'm seriously considering asking someone to give me membership as a gift. At least that way it's not awkward. Though I was aware that the Y's have guest passes, I just recently learned about free events that some gyms offer. Those are great ways of checking out the facility and classes before you sign up or ask for a membership as a gift. My old apartment building had a small gym in the basement with a few treadmills, a few bikes, and some weights. My current building doesn't have a gym but does have a pool. It doesn't hurt to look for it when you are moving to a new apartment. Now that you and Glen mention it, I remember a small gym at an apartment complex where I once lived. There were some weights and treadmill, not much but nice to have close by. Good tip to consider whether an apartment community has a gym before moving, as the facilities could save some money on a membership. Thanks for sharing your experience. I had never heard of the company; there are a couple of locations in nearby towns but the intro fee is $19.99 plus an annual fee. Still, some fees can be negotiable or there may be better deals in your area.